The company confirming it is getting rid of a position that had created conflict among the dealers. Beginning November 12th, the Casino Service Team Lead position is being replaced with the new position of Table Games Casino Supervisor. Casino Supervisors will not participate in the tip pool. As a result, dealers will be the only members of the tip pool, resulting in a net increase in pay. The new Table Games Casino Supervisor duties are extensive and include coaching and training of table games employees and well as participating in interviews and auditions for new table games employees. All current Casino Service Team Leads that are able to perform the new supervisory duties will be offered the new position. The dealers are happy to get extra money in the coming weeks but say they aren't giving up the fight over the tips they lost out on since 2011. "I personally have lost $150,000. 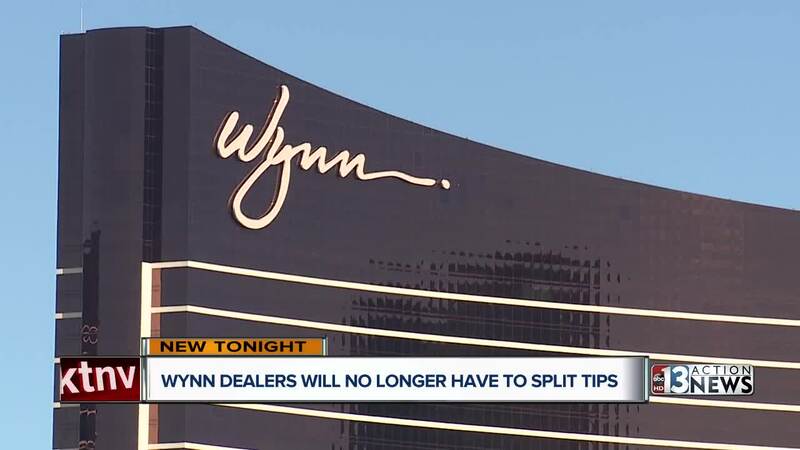 That is one dealer," Kanie Kastroll, a dealer at Wynn said about the tip sharing. At the center of the dispute are those "Casino Service Team Lead" positions that are now gone. Dealers said those employees were supervisors who should not get any portion of the tips, but the company said otherwise. As the fight led to lawsuits that worked their way through the court system. Kastroll is happy she will be getting all her tips starting next month but says she and her fellow dealers are not giving up the fight over the past tips. "We still want our money," Kastroll said. While they will see a boost in their income with the tips, Kastroll says it is partially offset by the company dropping dealers' pay by a dollar an hour just months after she says they were given a $2 an hour cost of living increase. The company did not confirm the pay change.